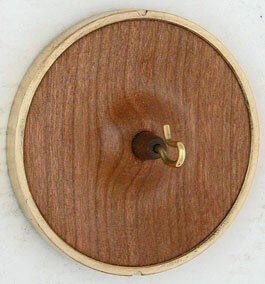 Golding "Micro" RingSpindles have a 2" whorl, with a walnut shaft measuring 3/16"x 6 3/4". These are our lightest weight spindles ranging from 0.4 oz to 1.0 oz. There are 6 solid woods available: Russian Bog Oak, Solid Birds Eye Maple, Lignum Vitae, Cherry, Ebony, and Purpleheart. Finely scrolled designs in cherry and purpleheart include the Tsunami, and Pinwheel. Please note: Color variations are normal in woods. Your spindle color and wood grain pattern may vary from the pictures shown. Please see our new Golding Micro Kate especially designed for plying yarn that has been spun on Golding 2" Micro RingSpindles.